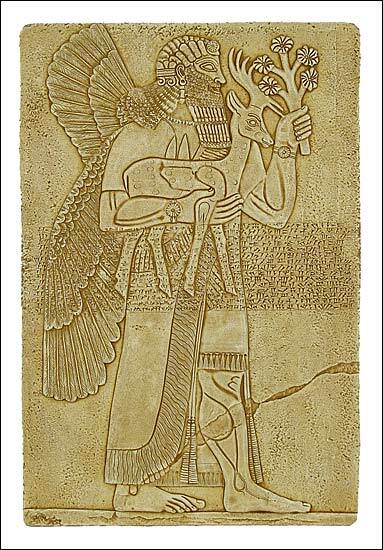 Assyrian protective spirit, assyrian art, assyrian. This relief, carved on gypsum, guarded an entrance into the throne room of King Ashurnasirpal II (reigned 883-859 B.C.) at his palace in Nimrud, the Assyrian capital. The tradition of protecting the entrances of buildings using magic was very old in Mesopotamia. Images of protective deities would be buried under doorways or set up at the entrances of palaces and temples. Their supposed magical strength would frighten away malevolent demons. The figure of a man with wings shown here is known as an �Apkallu� spirit. The significance of the deer and branch which the figure carries is unknown. Across the body runs the so called �standard inscription� of Ashurnasirpal which records some of the King�s titles and achievements and is repeated on many of his stone reliefs.